The battery-operated clock system made punctuality at Bishop Verot High School impossible. But when the school installed a Primex system, tardiness became a problem of the past. 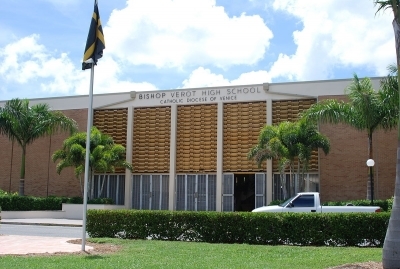 Bishop Verot High School is a robust, 11-building facility, bursting at the seams with on-campus activities. Before Primex, time management and tardiness were hindering academic and social life on campus. According to Todd Cordisco, the school’s Assistant Director of Institutional Advancement, a major part of the problem was the school’s battery-operated clock system. “We were using basic, battery-operated clocks like you’d buy at a discount store,” Cordisco said. “Nearly every clock on campus showed a different time.” For students with activities and classes in multiple buildings, the discrepancy in time made time management nearly impossible. The school found its solution in a Primex Wireless Clock System. With a single GPS transmitter, the entire campus, from the gymnasium to the classrooms, became synchronized to a single time. In addition, Primex’s virtually maintenance-free system fit in perfectly within the school budget and has the potential to save the school money in the future. The job of resetting clocks for Daylight Saving Time has become obsolete. All clocks on campus are synchronized to the same time, which has cut down on tardiness. The low cost of the Primex system has reduced maintenance costs.